Tacitus (/ˈtæsᵻtəs/; Latin: Marcus Claudius Tacitus Augustus; c. 200 – June 276), was Roman Emperor from 275 to 276. 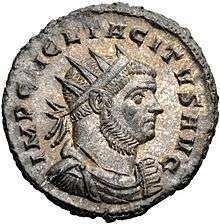 During his short reign he campaigned against the Goths and the Heruli, for which he received the title Gothicus Maximus. Tacitus was born in Interamna (Terni), in Italia. He circulated copies of the historian Gaius Cornelius Tacitus' work, which was barely read at the time, and so we perhaps have him to thank for the partial survival of Tacitus' work; however, modern historiography rejects his claimed descent from the historian as a fabrication. In the course of his long life he discharged the duties of various civil offices, including that of consul in 273, with universal respect. After the assassination of Aurelian, Tacitus was chosen by the Senate to succeed him, and the choice was cordially ratified by the army. This was the last time the Senate elected a Roman Emperor. There was an interregnum between Aurelian and Tacitus, and there is substantial evidence that Aurelian's wife, Ulpia Severina, ruled in her own right before the election of Tacitus. At any rate, Tacitus was situated at Campania when he heard the news of his election, and he quickly rushed to Rome. 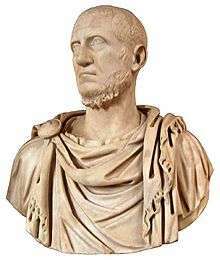 He decided to re-involve the Senate in some consultative manner in the mechanisms of government and asked the Senate to deify Aurelian, before arresting and executing Aurelian's murderers. Next he moved against the barbarian mercenaries that had been gathered by Aurelian to supplement Roman forces for his Eastern campaign. These mercenaries had plundered several towns in the Eastern Roman provinces after Aurelian had been murdered and the campaign cancelled. His half-brother, the Praetorian Prefect Florianus, and Tacitus himself won a victory against these tribes, among which were the Heruli, gaining the emperor the title Gothicus Maximus. On his way back to the west to deal with a Frankish and Alamannic invasion of Gaul, according to Aurelius Victor, Eutropius and the Historia Augusta, Tacitus died of fever at Tyana in Cappadocia in June 276. It was reported that he began acting strangely, declaring that he would alter the names of the months to honor himself, before succumbing to a fever. In a contrary account, Zosimus claims he was assassinated, after appointing one of his relatives to an important command in Syria. Chisholm, Hugh, ed. (1911). "Tacitus, Marcus Claudius". Encyclopædia Britannica (11th ed.). Cambridge University Press. Wikimedia Commons has media related to Marcus Claudius Tacitus.